New Assassin’s Creed 3 artwork box on the Amzon.co.uk ecommerce website has revealed that an hour of exclusive gameplay will be made available to PlayStation 3 gamers. During E3 earlier this year Sony also confirmed that PlayStation 3 exclusive content would be arriving in late October, which must be very close to the official launch of the game. 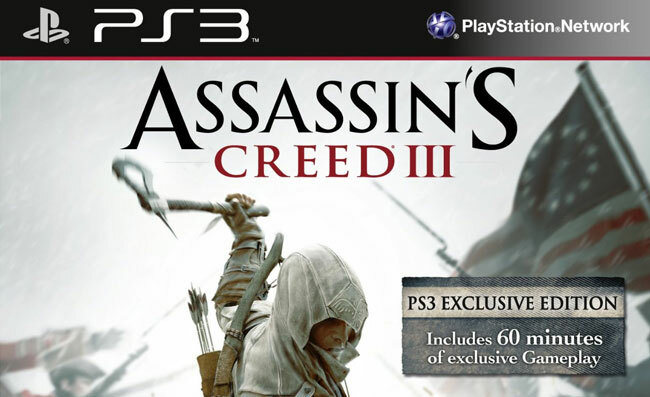 Sony also revealed it was creating a special Assassin’s Creed 3 PS3 bundle, which was also announced at E3, and will include a custom console and a copy of the new Assassin’s Creed 3 game. Assassin’s Creed 3 will be officially launching on PlayStation 3, Xbox 360, Wii U, and PC, with the console version of the game arriving on October 30th. Launch dates for Assassin’s Creed 3 on PC and Wii U have yet to be announced.